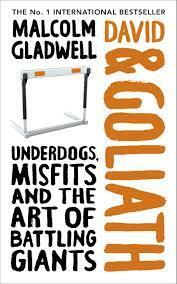 “David and Goliath – Underdogs, Misfits and the art of battling giants” is the new book from Malcolm Gladwell which is based on the premise that maybe we have all been looking at the David and Goliath story completely wrong. Gladwell starts by discussing specific details from the Biblical story to build the case that David the shepherd boy should have been the favorite in that battle. We all got it wrong because we were fixated on the giant that Goliath was, because we believed that it would be a close quarter battled where size, strength (of warrior, their sword and armor) would matter. But it wasn’t to be. He dips back into the classical economic theory to talk about the marginal utility curve being an Inverted U curve. And if we believe that its an inverted U curve, then there comes a point beyond which the marginal returns decrease. Or in other words, the same things that were an advantage at one point may become an advantage on the other extreme of the spectrum. As always, Malcolm backs his hypotheses with solidly researched stories. One of the interesting stories is that of an Indian software engineer (who had never played basketball before) coaching his daughter’s team to national finals. How this outsider looked at his team – a bunch of self proclaimed nerdy girls, and how he looked at the traditional way of playing basketball. His gameplan – play the full court press – was something that was so unexpected that they just surprised their opponents all the way upto the finals where their opponents did the same to them. The whole debate about class-size vs quality of education is again something where there is no clear answer and the reason is that the impact of an increase(or decrease) in class size depends upon which part of the curve the class currently is. It seems that if the class size is too small – there is no momentum in discussions and the intensity of possible interactions might be overwhelming for the kids. On the other hand, if the class size is too big the number of potential interactions may become too high to manage. Hence it seems the ideal class size is between 18-24. This is a great analysis for all those anxious parents who have been using the teacher:student ratio as a way of convincing themselves that they are giving their kids the best education possible. Apparently there is a simple rule in Israel – as soon as the class size crosses 39, they start another class. Another interesting debate that is brought up is whether its a good idea to be a big fish in a small pond or a small fish in a big pond. And Malcolm does this on a very sensitive topic. Should you always choose to go into the top most college that you have an offer from. I am sure, you know what he is hinting at. And apart from some well curated data on college choices and subsequent career success, he also brings forth the choice that the emerging bunch of impressionists made in Paris. The economic principle discussed here is Relative deprivation – comparing with peers and then deciding how we want to feel. Capitalization Learning Vs Compensatory learning: There is a detailed discussion on the lives of some very successful people who were dyslexic and how they managed to “compensate” for this apparent disadvantage. It seems that people who can build on compensatory learning (which is actually a very had and difficult approach) develop their own set of tools to thrive in their chosen fields. E.g. the trial lawyer who couldn’t read properly but had compensated this by listening and remembering things. The key lesson that I took away from this book is that start-ups in garages would continue to dethrone big companies because beyond a certain point, their size, capital, processes, existing customers – start becoming their biggest disadvantage. And when going head-to-head with a Goliath, don’t play by their rules. Make your own rules, where their disadvantage can be exploited.